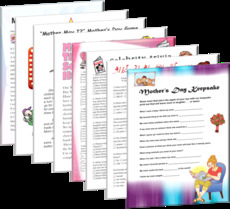 Mother's Day greeting cards to print, cut and fold for Mom or Grandmother! Beautiful print and fold greeting cards designed especially for Mother's Day. 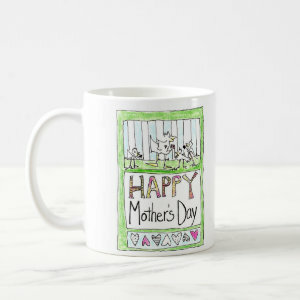 Give your Mom, Mum, Grandmother or Step Mom a lovely card - choose from 2 designs or visit our special links for custom Mother's Day card offers. 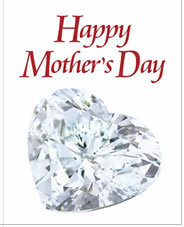 A heart shaped diamond decorates this printable Mother's Day card for Mom or Grandmother. Print card sheets on photo paper or card stock then trim along the guide lines. Using the cut out card as a guide, cut a slightly smaller liner sheet from vellum or pastel paper. Fold the liner sheet in half to match the card, then tack glue the liner to the inside of the card along the fold lines. Write your greeting on the liner sheet pages. You can add stickers, dried pressed flowers or glitter to embellish your Mother's Day hand made card. Pink and purple asters in a row frame a jumbo purple flower with Happy Mother's Day greetings..
You might find something perfect for your mother, grandmother, or sweetheart at Zazzle. 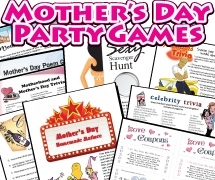 Browse our site shops to find ideas to design your Mother's Day greeting cards, paper crafts, decorations, or party favors.